Stir together the flour, cream of tartar, soda and salt. Use a pastry blender to cut the shortening in until the mixture is crumbly. Gradually pour in the buttermilk, stirring with a fork until the ingredients form a loose dough. Don’t overmix. Scrape onto a well floured surface and pat the dough into 1″ thick circle. Use a biscuit cutter, or a glass or the lid from the peanut butter to cut the biscuits. Make sure to flour the cutter and don’t twist the implement you’re using – just press straight down and lift. 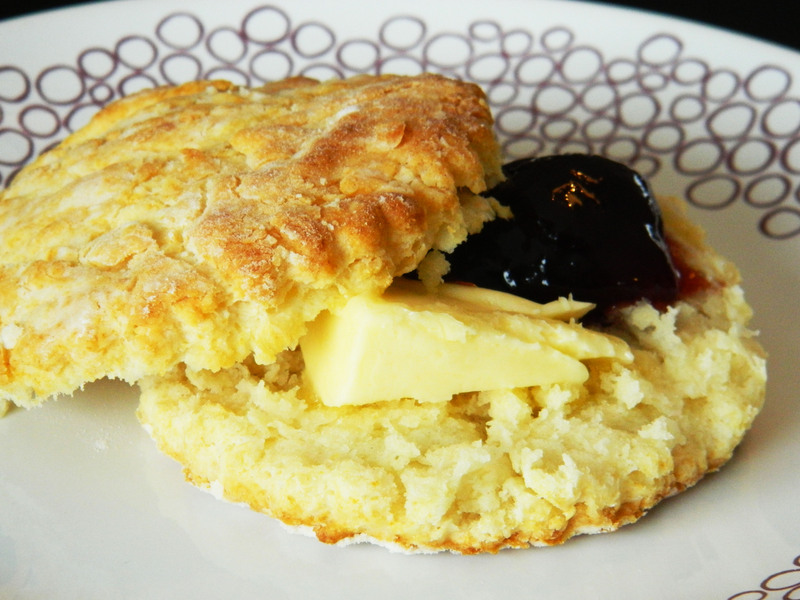 If you twist, this can affect how high the biscuits rise. Bake on a floured sheet at 450 degrees for about 12 minutes. *A note on buttermilk… Yes, buttermilk is expensive and is kind of a pain because it really only comes in a 1 litre carton. You use 1 cup then you have to figure out what to do with the rest unless you have a crazy family member who likes to drink buttermilk. This is why I buy DRY buttermilk powder at the Bulk Barn. I throw 3 or so tablespoons into a 1 cup liquid measuring cup and reconstitute it with 1 cup of regular 1% milk. Works great!